A fast acting (4-7 days) joint support product for horses which contains the highest quality purest ingredients and with the added advantages of Boswellia. Glucosamine is an important building block for cartilage. It helps cartilage to act as a shock absorber. Chondroitin helps maintain synovial fluid viscosity to give extra joint support and is also an important building block for cartilage. Vitamin C is a powerful antioxidant required to produce collagen. Collagen is the main supportive protein in cartilage, ligaments, tendons, and connective tissue. Zinc is important for healing in the body and is also required for the synthesis of collagen. Boswellia is a plant extract which plays an important role in maintaining smooth and comfortable joint movement. 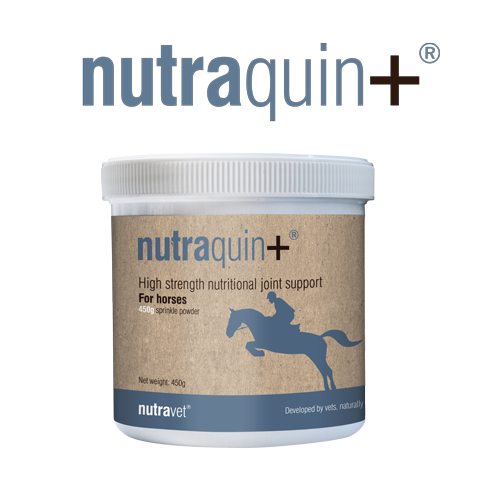 Nutraquin+ is to be given to your horse as recommended by your veterinary surgeon. Powder can be sprinkled onto or into your horses usual food. If allergic to foodstuffs containing crustaceans, take care when handling as product contains ingredients of seafood origin. Reseal poly bag and close container after use. Do not store below 5c or above 25c.